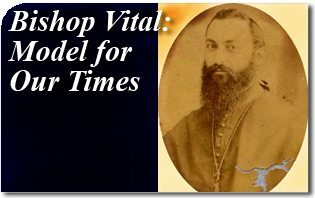 In an article commemorating the centennial of the birth of Bishop Vital Maria Gonçalves de Oliveira(1844-1878), commonly known as Dom Vital, Professor Plinio Corrêa de Oliveira extols the virtues of this prelate who resisted the secular authorities of his time. Generally speaking, Brazilians have a confused notion of who Bishop Vital Maria Gonçalves de Oliveira was. We know that he was a bishop of rare valor, who faced great perils in order to overcome the sworn enemies of the Catholic Church. Valor in defense of good and truth, however, is not a popular virtue. If there were holy cards and pictures of Dom Vital kissing babies, smiling to multitudes, giving blessings, and distributing alms (all attitudes proper to a bishop), he would bask in popularity. Instead, his photo [click here to enlarge] depicts a young Dom Vital of pleasant yet strong features: his broad, high brow portrays audacity; his deep, serious gaze twinkles with intelligence and strength; he wears a manly beard, black and long; his bearing is noble and energetic. The adorable moral profile of Our Lord Jesus Christ manifests the full spectrum of virtue, from the ineffable tenderness with which He said “let the little children come to Me” to the terrifying majesty which hurtled His enemies to the ground when He said the words “I am He” in the Garden of Olives. Similarly, the moral profile of a bishop of the Catholic Church should also encompass all aspects of virtue, from tenderness to pastoral severity. However, Our Lord grants each one of us the grace of illustrating the Church by reflecting a particular spiritual facet. For instance, He calls some to edify Christianity by the splendor of their tenderness like Saint Francis de Sales. He calls others to defend Christianity by their pugnacity and their strength, as did Pope Saint Gregory VII and Dom Vital. The latter’s heart was overflowing with tenderness and kindness. It was precisely this kindness that compelled him to rise up like a giant, by staking everything he possessed: his life, health, tranquility, reputation, losing close friends, and gaining endless enemies, all to defend the souls which were being dragged to hell by the enemies of the Church. There are times when authentic and genuine pastoral tenderness requires on to imitate Job: “I broke the jaws of the wicked man and out of his teeth I took away the prey” (Job 29:17). If Dom Vital had excommunicated men who had caused material damages to widows and orphans, he would have been applauded by the whole country and everyone would have acknowledged that his just severity was inspired by charity. Church enemies cause moral damages, however, not material ones. We live in a materialistic era that only acknowledges as evil that which harms the body. It was precisely spiritual and immortal souls, redeemed by the Precious Blood of Our Lord Jesus Christ that were being lost daily. The loss of a single one of these souls would be a disaster far worse than if the sun were to be extinguished, if the Earth were to crash into the moon or if the entire city of Recife were to disappear beneath the ocean. Likewise, it would have been incomparably worse if Dom Vital had closed his eyes to this spiritual tragedy than if he would have shut himself within the comfort of his palace to shield his ears from the cries of indigent widows and orphans. It was to fulfill his duty of pastoral charity — of spiritual charity — that Dom Vital stood tall and firm. There are no emotional, material symbols for this kind of charity. One can be moved by a painting portraying someone distributing bread to the poor, but not many would be moved by a painting portraying someone in the act of “breaking the jaws of the wicked man”, with a dislocated jaw and teeth strewn on the ground blood dripping. It is easy to grasp how noble, just, Christian, and praiseworthy alms-giving is: no explanation is necessary. It requires long reflection, though, to grasp when it is good and praiseworthy to meddle with “the jaw of the wicked man.” If there is one thing modern man detests more than reflection, it is long reflection over a matter. It comes as no surprise, then, that the average person today increasingly fails to grasp the significance of acts of charity like those practiced by Dom Vital. Herein lies the most providential aspect of Dom Vital’s mission in my view. By his example, Dom Vital teaches us that the soul is worth more than the body; hence we must do more to defend the soul than we would do to defend the body. He also teaches us that, while all true Christians should prefer harmony over discord, meekness over pugnacity and conciliation over conflict, nonetheless there are circumstances when it is our duty to cause discord, where conflict is inevitable and where pugnacity is a moral requirement. A human soul is so valuable that all valor, all energies and all licit means of resistance must be employed in its defense. When it comes to fulfilling our duty, we must go to extremes, just as Our Lord did; He never cast aside His Cross; rather He carried it to the top of Calvary where He then lay down upon it and allowed Himself to be nailed to it and upon which He died — all because He wanted to do His duty: to obey His Father’s will. The preceding article was originally published in The Legionário, on June 8, 1944. It has been translated and adapted for publication without his revision. –Ed. 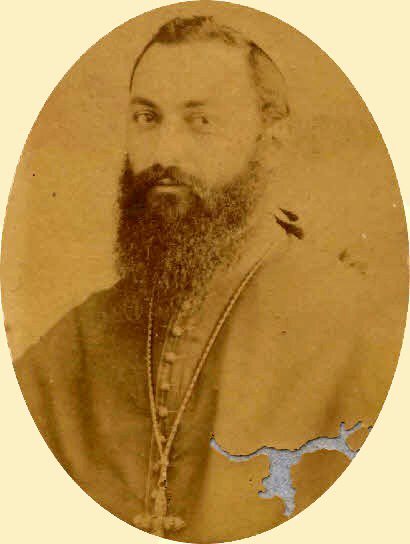 This entry was posted in Plinio Corrêa de Oliveira and tagged beard, biology, Bishop Vital, broad, charity, history, masonry, pastoral, piety, Plinio, purity, smiling, virile, virtue by Plinio Corrêa de Oliveira. Bookmark the permalink.